Welcome guests and clients with a stunning display when pairing the Vienna Round Tabletop Planter with succulents, cacti and other greenery. 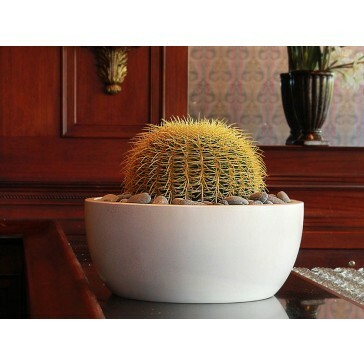 Whether this planter is placed on reception desks, countertops or other surfaces, you’re sure to create a long-lasting impression for visitors to hotels, office complexes, restaurants, hospitals or other public and private buildings. The understated and stylish Vienna Round Tabletop Planter is handmade by master craftsmen using high quality fiberglass and a professional automotive grade finishing process that lends to its durability. The planter can withstand a wide range of weather conditions, including direct sunlight and freezing rain. Use them to add greenery and style to surfaces throughout various outdoor areas, including lounge spaces, patios and decks at hotels, spas and resorts. The Vienna Planter is available in five standard finishes — Matte Black, Matte Charcoal, Matte White, Matte Dark Brown and Metallic Silver. These neutral colors can be used in a wide range of commercial design projects with ease.